About: Located in northwestern Montana, Kalispell Regional Medical Center is a 288-bed, acute care hospital that provides a wide variety of healthcare services to the residents of Flathead Valley. Challenge: As Kalispell transitioned to an alternative payment model, they needed to broaden their focus from the patients they saw regularly to the patients they saw sporadically. To identify these unengaged patients, they needed a convenient means to determine everyone for whom they’re responsible. Kalispell discovered they were relying solely on physician visits to meet all the care needs of their patients and turned to MEDITECH’s Patient Registries — a comprehensive population health tool — to help them identify, stratify, and engage their patient communities. Execution: As Kalispell moved to the CPC+ reimbursement model, they determined that Patient Registries could support their shift from fee for service to value-based care. They designed their registry workflows so that all meaningful, documented patient data would flow directly to registries so that clinicians could verify whether they were meeting care protocols, helping them to be more proactive in fixing poor compliance rates. Have fewer patients leaving the ED without receiving timely follow-up from their PCP’s office. 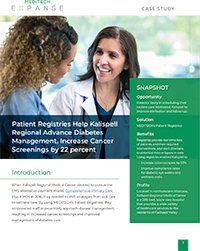 Thanks to their success with the Wellness and Diabetes Registries, Kalispell is exploring a wide range of registry options to help manage organization-wide performance improvement efforts.